Design and screen – is a generous-sized phone. It has a 4 inch screen with a resolution of 480 x 800 pixels and 16.7 million colors but the display continues at the top and bottom with at least 2 to 3 cm on each side and gives the impression of massiveness. The backside is made from metal and when you will hold it your hand, it will look pretty solid. On the upper side are positioned the 3.5 mm jack and the microUSB socket which has double role of PC connectivity and charging the battery. On the left side is positioned only the volume with the two buttons for adjustments. On the right side you will find the power button and the button for quick access of the photo camera. The 5 megapixel sensor of the camera knows record HD at 25 fps and is accompanied by a LED flash.The photo camera sensor is incorporated into the housing. The battery case is coming out easily. To mount the SIM card is necessary to remove the battery of 1500 mAh. The microSD slot is missing, but the 8 or 16 GB will be enough to store your movies, MP3 songs, photos, documents. Next to the photo camera is positioned the speaker that amazes with quality. It is not noisy like the one on the LG Optimus One and even on the maximum volume it offers the most pleasant listening. The screen is superbly and from the first time when you will use it, you will realized how advanced the SuperAMOLED technology is . You can see decently even in bright sunlight. Black looks more natural. You can adjust the brightness, but this smartphone also has a sensor that automatically adjusts. For better control of the functions from Omnia 7 there are three touch buttons with role of Back, Home and Search. The processor is a Qualcomm Snapdragon QSD8250 Scorpion clocked at 1 Ghz and it is sustained by Adreno 200 GPU in video processing performance. It also brings 512 Mb RAM and 8 or 16 GB for saving your personal files. 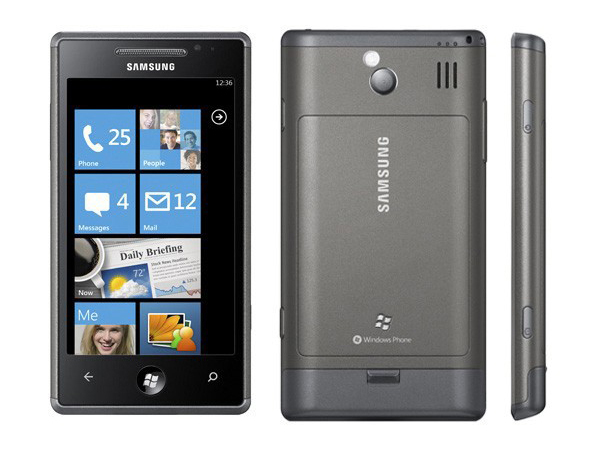 Windows Phone 7 is the mobile operating system from Microsoft and it will impress you with speed and originality. The Internet Explorer from WP7 works perfectly, it displays the web pages very fast and is a pleasure to browse the WWW. with the SuperAMOLOED display from Omnia 7. To install applications from Windows Phone 7 Marketplace you will need to have an email address on hotmail or live and the rest flows of itself.